Flat Glass Market size surpassed USD 80 billion in 2016 and demand should exceed 120 million tons by 2024. Rapid industrialization & urbanization in India, China, Malaysia and Thailand coupled with adoption of smart & energy efficient technology as advanced construction practice should have positive influence on flat glass demand. Significant investments are being made for modernizing existing airports & terminals in Asia Pacific, with India alone planning to spend over USD 15 billion in 2017. It is increasingly used for interior designing, replacing traditional materials like stone and wood for constructing floors, stairs, bathroom & walkways. 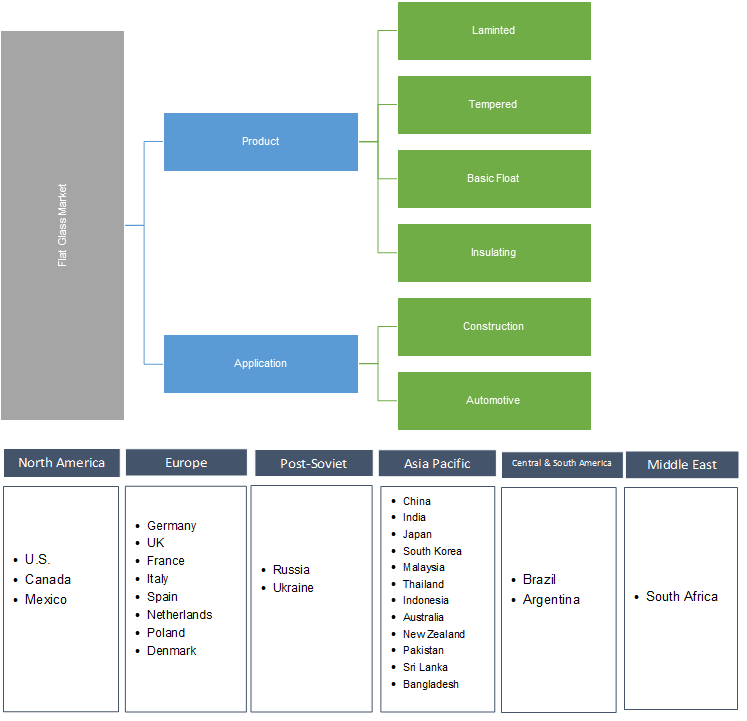 Increasing application scope for manufacturing window & windshield for automobiles should drive flat glass market size during forecast period. China commercial automotive production surpassed over 3 million units in 2016 and expects positive gains during the forecast period. Increase in per-capita middle class disposable income levels should drive automobile industry and support regional product demand. Introduction of green buildings demand specialty products complying FEED and FEMA standards for safety applications should favor product demand. Intervention of nanotechnology in producing solar control & lightweight glazing glass and hybrid guide plate along with companies like Corning developing affordable technologies will be critical growth driver. Silica sand, natural gas and soda ash are key raw materials used during the manufacturing process. Any supply demand deficit in availability of key raw material might affect flat glass market price trend. High infrastructural & transportation cost might directly impact industry growth. Emphasis on energy efficiency along with increasing application scope in solar energy segment should offer flat glass market growth opportunities. 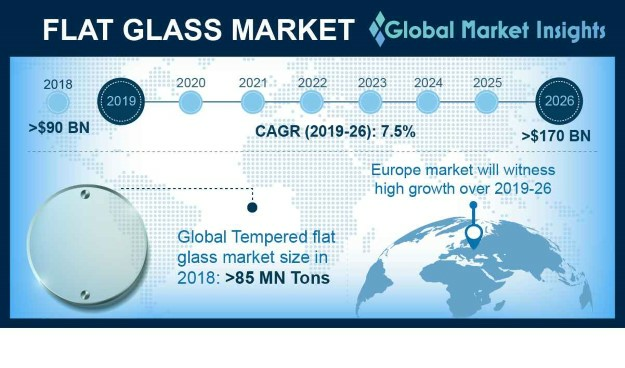 Flat tempered glass market size should surpass USD 40 billion by 2024 owing to strong application scope in residential & commercial construction projects. Its exceptional hardness and ability to break into small harmless pieces upon impact reduces risk of injury and should boost global product demand. Flat insulated glass market size should witness significant gains to surpass 2.2 billion square meters by 2024 due to growing concern towards low energy usage & reducing carbon emission. Compliances to meet set forth by LEED for constructing energy efficient commercial & residential buildings by reducing air to heat transfer, using low emissivity coatings perform in energy saving applications saving building maintenance costs. Float glass market size will witness gains over 5% during forecast period owing to its strong application scope in construction projects. It is majorly used as doubled glazed windows for both commercial and household application and requires further processing by toughening, coating and laminating to function as advanced product in construction industry. Flat glass market size from construction applications should surpass USD 100 billion by 2024. Positivity outlook in construction spending along with consumer demand for aesthetic & energy efficient interiors should bolster product demand. Shifting trends towards small scale construction projects should enhance existing product demand. Technological advancements in construction projects has led to new product development increasing sustainability, comfort, style and safety. Global flat glass market size from automotive applications should grow at a rate of over 7% during projected period. Strong application outlook in manufacturing windows, windshields & backlight should promote product demand. Rising demand for luxury cars owing to increased disposable income, emphasize on using laminated products for sun roofing and smart technology driving flat glass market size. North America, led by Canada and U.S. flat glass market size, expects gains at over 6%. Growth in residential & commercial projects along with shifting builder preferences towards natural insulation, environmental protection, safety and security should boost regional product demand. Supportive government regulations and initiatives regarding environment protection promoting use of ecofriendly and recyclable building material should catalyze growth. China flat glass market size should surpass USD 50 billion by 2024, owing to its flourishing automobile production and construction industry. Technological advancement in production process and wide distribution channel should have positive outlook in regional product demand. Improved living standards will further catalyze demand for solar panels and interior structures. Global flat glass market share is fragmented and competitive. Asahi, Saint-Gobain, NSG Group, Corning, Schott, Trulite, Astro Cam, CSG, Xinyi and Sisecam are the some of industry participants. Companies are shifting & setting up their production bases towards Asia Pacific countries to avail low labour wages, government subsidies and availability of raw materials. Companies also partner up to size up production capacity and new product development along with gaining regional expansion which should have positive outlook on flat glass market growth. Flat glass market is initially produced in plane form and has major applications in transparent walls, windscreens, windows and doors for construction industry and as windshield & windows in automotive industry. It has lower concentration of calcium oxide, silica and aluminium oxide. Key properties include transparency and recyclability which makes the end-product suitable for packaging applications. Flat glass market production process involves the molten silica mixture to be cooled under careful conditions. The annealing process helps in removing the undesirable stress from the product. Annealing requires heating to a temperature to soften which is cooled instantly by maintaining the desired temperatures. This process produces desirable conditions of induced stress and results in additional resistance to thermal stress, strength and impact resistance.